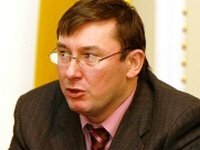 Former Ukrainian Interior Minister and currently leader of the organization called the Third Ukrainian Republic, Yuriy Lutsenko, is in intensive care at a Kyiv clinic after a clash with members of the Berkut riot police task force near the Sviatoshynsky district police department in the early hours of Saturday, the Third Ukrainian Republic said in a statement. "Yuriy Lutsenko has been taken to a city clinic. According to preliminary reports, based on tomography findings, doctors diagnosed closed-head injury, concussion, and three subdermal hematomas and put a 3-centimeter long stitch on his head. The politician is in intensive care now. He is conscious," the statement says. Lutsenko's wife Iryna claims that the former minister was injured while trying to prevent a clash between security forces and activists of the so-called Avtomaidan movement, who had blockaded buses carrying Berkut members at Peremohy Avenue in Kyiv early on Saturday.